SmartDraw is a flowchart maker and diagramming solution used by organizations and companies to document processes, manage projects, and plan strategies. Powerful and easy-to-use, it is regarded as an alternative to Visio, a diagramming and vector graphics application from Microsoft. With SmartDraw, users can make any type of diagram, whether its chart-based, graph-based, or schematic. The diagramming software, furthermore, is built with thousands of templates and symbols for creating diagrams, flowcharts, organizational charts, electrical circuits, software design plans, infographics, forms, and other visual presentations. SmartDraw also has the capability to be integrated with other tools such as Microsoft Word, Excel, PowerPoint, and Outlook. Last but not least, SmartDraw allows users to collaborate on their drawings and visuals by permitting them to easily share files with each other. SmartDraw is a diagramming software which is more affordable and much easier to use than Microsoft Visio. As an alternative to Visio, the software allows users to create diagrams and visuals from any Windows or Mac computer, and any mobile device. They will also be able run it online through a web browser. For security purposes, SmartDraw permits users to install the software behind a firewall on a Windows desktop. Making diagrams and charts is a great way to represent information. Diagrams and charts are used to document facts, draw plans, and capture ideas. In addition, they aid organizations and companies in improving communication, learning, and productivity. With SmartDraw, any type of diagram can be created. In general, the diagramming software allows making three types of diagrams: chart-based, graph-based, and schematic diagram. Another type of diagram that can be created using SmartDraw is a schematic diagram. This diagram shows elements in a system. An example of this is a floor plan, which displays the precise measurements and placement of elements. Schematic diagrams often use standard sets of symbols. 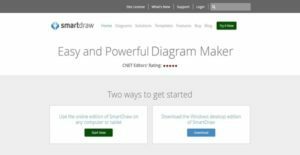 SmartDraw is built with more than 4,500 templates which can be used for over 70 different types of diagrams, charts, and other visuals. It offers over 3,500 symbols that can be applied to different disciplines which include engineering, software design, and healthcare. The software is also equipped with the standard shapes used for creating flowcharts, organizational charts, and other diagrams. Creating diagrams through SmartDraw is made much easier as the software automates the drawing process. As users add, delete, or move shapes; the diagram is automatically adjusted and the formatting is maintained. With such powerful automation, they will be able to build and enhance their drawings easily. When it comes to creating architectural and engineering diagrams, SmartDraw provides an AutoCAD-like annotation layer that resizes automatically to match the diagram. With SmartDraw, sharing drawings and collaborating is effortless. This is because the software delivers powerful integration capabilities. With just a single click, diagrams and drawings can be sent directly to Microsoft Word, Excel, PowerPoint or Outlook. Through the aid of SmartDraw Cloud or integrating the software with their file sharing apps, teams can work on the same drawings. Likewise, it has plug-ins which enable users to add drawings to Google Docs and Sheets. If you are interested in SmartDraw it might also be a good idea to analyze other subcategories of Best Architecture Software collected in our database of B2B software reviews. Every business has its own characteristics, and can call for a particular type of Architecture Software solution that will be adjusted to their business size, type of customers and employees and even particular industry they deal with. It's not wise to count on finding an ideal app that is going to be suitable for each company no matter what their history is. It may be a good idea to read a few SmartDraw reviews first and even then you should pay attention to what the software is intended to do for your business and your staff. Do you need a simple and straightforward app with just elementary functions? Will you really use the complex functionalities needed by pros and big enterprises? Are there any specific features that are especially useful for the industry you work in? If you ask yourself these questions it will be much easier to find a solid software that will fit your budget. How Much Does SmartDraw Cost? We realize that when you make a decision to buy CAD Software it’s important not only to see how experts evaluate it in their reviews, but also to find out if the real people and companies that buy it are actually satisfied with the product. That’s why we’ve created our behavior-based Customer Satisfaction Algorithm™ that gathers customer reviews, comments and SmartDraw reviews across a wide range of social media sites. The data is then presented in an easy to digest form showing how many people had positive and negative experience with SmartDraw. With that information at hand you should be equipped to make an informed buying decision that you won’t regret. What are SmartDraw pricing details? What integrations are available for SmartDraw?